maid, laundress, cook and occasionally as a nurse's assistant. The hospital, which had only female doctors and assisted women in the study of medicine, was also the first hospital in the United States to offer a nursing program. It is now the Dimock Community Health Center. After working at the New England Hospital for 15 years, Mahoney was accepted into their nursing school in 1878 at the age of 33. The 16-month program was very rigorous and consisted of 16-hour days. When the students were not working on the wards at the hospital or doing private duty in patients' homes, they were expected to attend daylong classes and lectures. Only four of the original 42 students who started the program had the stamina and willpower to complete the course. 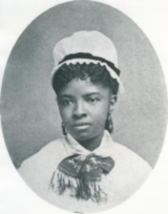 When she received her diploma in 1879, she became the first black American professional nurse and joined the ranks of famous nurses in history. Mahoney devoted herself to private duty nursing for most of her 30-year career because of the still prevalent racial prejudice in public nursing. Many of her patients were from prestigious families and were impressed with her skill and professionalism. At the end of her career, she was director of a black orphanage in New York. She dedicated herself to her work and never married. In 1896, Mahoney joined the newly formed and primarily white Nurses Associated Alumnae of the United States and Canada, later known as the American Nurses Association (ANA). Because of their slowness in accepting black members, she helped form the National Association of Colored Graduate Nurses (NACGN) and spoke at their first convention in 1909. At that time, she addressed the inequalities for African-Americans in nursing education and asked for a demonstration at the New England Hospital. The convention wholeheartedly supported her, elected her chaplain and gave her a lifetime membership. For many years, she worked to recruit minority nurses to join the organization. Largely because of her efforts, the number of African-American nurses doubled from 1910 to 1930. Even after her retirement from nursing, Mahoney was very active in fighting for women's equality. It should be no surprise that she was one of the first women to register to vote in 1920. After a three-year battle with breast cancer, Mary Mahoney died on January 4, 1926 at the age of 81 and was buried in Everett, Massachusetts. Mary Mahoney left a legacy that is just as vital today as it was when she was alive. She fought not only for women of color but also for educational and professional rights for all minorities. The numerous awards and honors in her name testify to this fact. In 1936, the NACGN created the prestigious Mary Mahoney Award to honor those who advanced the welfare of minority groups in nursing. When the NACGN merged with the ANA in 1951, the ANA chose to continue the award. There is also a Mary Mahoney Medal given annually for excellence in nursing. In 1976, she was chosen to be in the Nursing Hall of Fame and in 1993, the National Women's Hall of Fame. There are a number of writings available for those who want to know more about this extraordinary woman who helped shape the entire nursing profession. Susan Muaddi Darraj has published the book, Mary Eliza Mahoney and the Legacy of African-American Nurses (Women in Medicine) . Many other books are available that document the contributions of blacks in the 18th and 19th centuries, including those of Mary Mahoney. Nursing journals and biographies are also a rich source of information about Mahoney's contributions to nursing.